Well, the first week of marriage has come and gone and I have to say that I’m loving every minute of it. Of course, we’ve been on our Hawaiian honeymoon the whole time, but it really has been amazing. 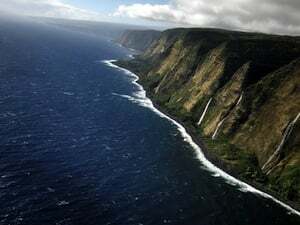 I highly recommend a trip to the Big Island of Hawaii to any potential honeymooners, especially those that want a mix of relaxation coupled with a “choose-your-own-adventure” atmosphere. I have to give kudos to the honeymoon registry (and of course the people who contributed) because it helped give us the excuse to “splurge” on all the fun things that we may not have normally done. My wife Becca and I had been living together for a few years before we got married, so we already had many of the traditional registry gifts. Meanwhile, since we love to travel, this was the perfect alternative. For us, it turned into a mini scavenger hunt where we had to get to some location and take a picture. Some were easier than others, of course, but overall it was really fun and we enjoyed every moment. When we were looking at places to honeymoon, we decided on a package deal through Costco, which included airfare, hotel and car rental for about $2,500 for both of us for a one-week stay in June. We picked the Big Island of Hawaii based on recommendations from friends and since we had both separately been to Honolulu and Maui. This was going to be a new adventure for both of us. Note: Everything marked with an asterisk (*) below was part of the honeymoon registry. After landing in Kona, we picked up our rental car and took it to our hotel on the Kona Coast. Becca had set up much of our Travelers Joy honeymoon registry by going through the guidebooks to find things we wanted to do and also by viewing other people’s registries to get more ideas. We knew we had things to do from the registry and also things that did not make the registry, so we spent the morning of our first day coming up with a rough outline of what to do for the week – and making reservations for what we had planned as well. After that, we hit the beach and went snorkeling. Since we had our own snorkel gear*, it was really easy to do. It was not long before it was time to shower up and head to the Fairmont Resort to have dinner at Brown’s Beach House*, an outdoor restaurant with exquisite food and a view of the ocean that can’t be beat. 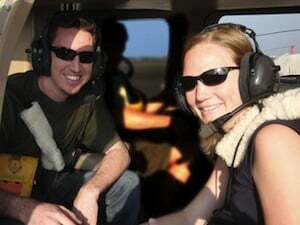 The first thing we had made reservations for was a helicopter ride*, but it wasn’t an ordinary out and back. We signed up for a day trip to Hilo where the copter takes you out in the morning to Hilo, provides a rental car while you are on the east side of the island and then a copter ride back in the evening. The best part was that we got to see the majestic valleys of the Waipio Valley in the morning, with its huge waterfalls and luscious green landscape. Then on the ride home, they took us over the active volcanic lava flows, which were truly amazing. We also saw several rainbows, including a full-circle one which we tried to fly through, but were never quite able to catch. We have pictures and video, but it’s really just something you have to experience first-hand. While in Hilo, we drove up to Rainbow Falls, Boiling Pots and Pe’epe’e Falls east of Hilo. Then we went north to Akaka Falls and on the way took the four-mile scenic drive on the old highway through some great tropical coastal country. Did I mention they upgraded us to a sporty little red convertible? That really topped it off well. Driving through the lush tropical coastline with the top down can’t be beat. We took a break at Onomea Bay, a beautiful tropical coastline, and peeked into the Botanical Gardens. For lunch, we stopped at a little café called What’s Shakin’ – recommended by our helicopter pilot -- and it specializes in fresh fruit smoothies, sandwiches and wraps. 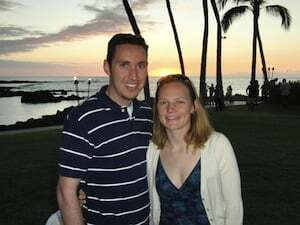 At the end of the day we went for a romantic dinner of Becca’s choosing* at Huggo’s on the Rocks, back in Kona. It literally was on the sand and had a great Hawaiian cover band playing. We went down the coast to Kealakekua Bay where Captain Cook’s Monument is located and rented a kayak*. This was a great time for the adventure seeker as just getting into the water was a challenge! Basically, you drop your kayak – loaded with our snorkel gear and a dry bag that came with the rental – into the water at the edge of a concrete slab that’s about four feet above the water, with waves coming in to boot. I’m not sure how we did it, but we managed to successfully launch the kayak without going overboard and paddled out to the monument. After we had our fill of snorkeling, we climbed back in the boat and skirted the shoreline on the way back to the launching dock. By the time we got back there were local Hawaiians helping people in and out of the water. A very large Hawaiian man plucked us from the kayak and got us up the four feet to the edge of the slab – no joke. He then grabbed the kayak and pulled that in as well. We then stopped for lunch at The Coffee House*, a small café on the edge of a cliff overlooking Kealakekua Bay. It offered great views and the geckos pretty much pose for you in various photo opportunities on the outdoor terrace. The next stop on our tour of South Kona was the Place of Refuge (Pu’uhonua o Honaunau), an ancient area where people who had been beaten in battles could seek refuge. Afterwards, we walked over to a snorkeling spot called “Two-Step” due to the fact that there is a rock ledge that has two steps to get in/out of the water. It proved to be a little daunting at first with the waves crashing into the rocks, but after you get through it, it’s not all that bad and was the best snorkeling spot up to that point in the trip. We heard later that it’s quite common to see and swim with dolphins, especially if you go out to the deeper waters. We made it back to our hotel for a quick shower and then out to the Royal Kona Resort for a fun Luau (almost a must-do when vacationing in Hawaii). It had the usual complement of great food, dancing, and that typical laid-back Hawaiian atmosphere. This day started out as a day of rest and relaxation…until about 10 AM. We then set off at a brisk pace heading up the coast to a little snorkel spot called Mauna Kea Bay. We had a tip that this was the best snorkeling on the coast from a friend back home. It’s about a 45 minute drive from our hotel. We were extremely lucky as the beach is located inside a resort and the resort only allows 30 cars in per day. We were literally car number 30, but we got a spot and trotted through the resort to the water. First off, getting into the water was by far the easiest as it is a white sandy beach (what you think of when you think Hawaii) that you just walk right in to. Second, there are two sides of the bay, both of which certainly didn’t disappoint and have my vote for the best snorkeling. The coral reefs are amazing and there’s a great mix between deep coral “valleys” and more shallow areas with an abundance of sea life. I almost swam right into a rather large sea turtle before Becca grabbed my leg and pointed it out. We were literally a couple of feet away while it mindlessly chewed on bits of something on the coral reef. We were also able to eat at the beachside bar that was part of the resort and use their bathrooms/showers, which were extremely convenient. The only downside came a few hours afterwards when we realized that the sunscreen had only lasted through the first snorkel excursion and the second snorkel trip had turned our backs into shades of red. The honeymoon registry once again prompted us to continue our drive up the coast towards the town of Waimea for dinner. We were a bit ahead of schedule so we made a pit stop in Kailua at the harbor. Becca was bound to find some ice cream and just as we were leaving she spotted an ice cream cone sign. We enjoyed delicious local ice cream – Kahola road for Becca (rocky road, but with macadamia nuts) and blueberry for me. We continued on our way up to Kahola Mountain Road Lookout for a view of the harbor and coastline from 3,000 feet above. We were then off to Waimea, where Becca had chosen a restaurant called Merriman’s* because of its local and organic food. It, too, did not disappoint. It was fantastic food and we took them up on their specials (swordfish with half a lobster tail for me and sliced lamb, leg and shoulder for Becca). We couldn’t pass up on a bottle of wine, dessert (chocolate cake with Tahitian ice cream), and French press coffee. On our way back down the mountain to our hotel, we spotted a “moonbow”, which is like a rainbow, but white and caused by the moon. It was a new sighting for both of us. The day started with a call to Mamalahoa Hot Tubs & Massage to postpone our appointment due to our sunburns. 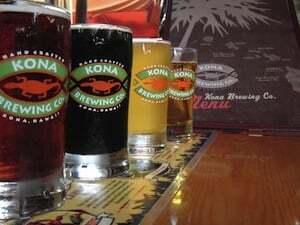 We figured we would use this as a good reason to have drinks at the Kona Brewing Company*. We started with a beer sampler – a porter, Longboard Lager, a red ale, and a wheat ale. After a couple more beers and a pizza, we rolled out with our bellies full and made it back to the hotel to take a nap. Yeah, this was a rough day. We woke up in time to make it out to the marina where we set out on a three-hour tour*. Luckily, there was no Gilligan on this boat ride. It was a night snorkel/dive trip that cruised along the coast to a known manta ray feeding spot. On the way out, we happened across a group of spinner dolphins that seemed to have a lot of fun swimming next to the boat and jumping out of the water. I have never seen such playful dolphins. When we arrived at the manta ray spot, the sun was just going down and everyone put on wetsuits and jumped in the water. After about an hour of chillin’ quite literally in the water without any signs of the mantas, our boat captain pulled the plug and we returned to the boat without seeing any mantas. I figure it’s kind of like fishing in that it’s great if you catch a fish, but really a lot of the enjoyment is just being out there in the water. We warmed ourselves back up, grabbed some champagne on the way home*, and certainly didn’t let our one week anniversary of being married go to waste. The morning started out with a trip to the Mountain Thunder Coffee farm*. We learned all about what it means to drink 100% Kona coffee and also what it takes to have an organic coffee farm. After the coffee farm tour and tasting of delicious Kona Coffee, we set out to the mystical Mamalahoa Hot Tubs*. We spent a half an hour soaking in the tubs, then had a 60-minute massage, which were both truly amazing. We then relaxed for the rest of the day. Our plane departed at 12:30 PM, but why waste a perfectly good morning in Hawaii? We headed down to the local surf spot and used some boogie boards that we had borrowed from the hotel to hit the waves. It was a great way to end the trip!